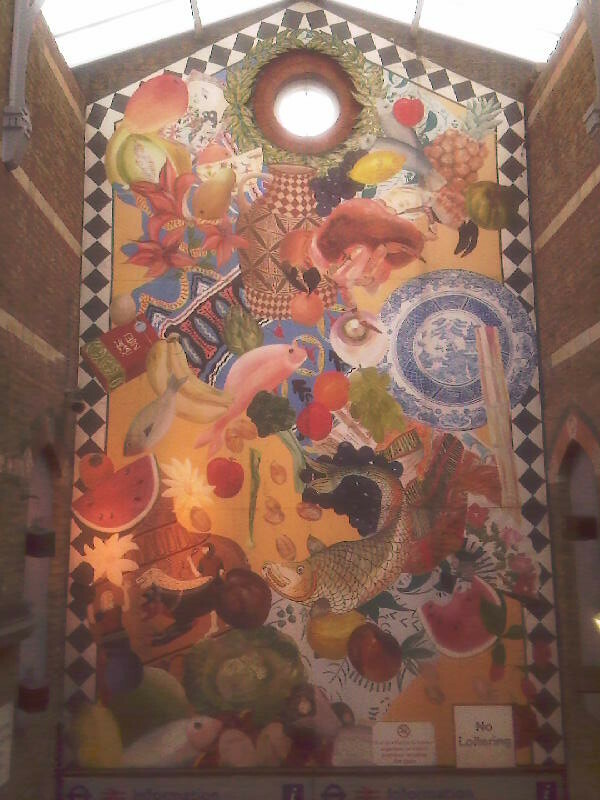 If you are having the slightest thoughts about food and making some interesting culinary delights, then have a visit to the murals in Brixton station. It is home to two large murals which show the products that could be bought in the market back in 1986 when the pieces were created. One mural, painted on boards, is located on the staircase as you exit the platform. It shows a range of the food products available in the market back then - in fact you can still get many of these items today. There are apples, oranges, watermelon, fresh fish, dates, grapes, lemons, pineapples all on a background of fabric with the occasional bit of crockery. These murals were painted in 1986 as part of the station's refurbishment. The artists who worked on both pieces are Karen Smith and Angie Biltcliffe who were working under the name Anchor Designs. They had previously been involved with works on Stockwell Park estate which have now gone. It's great to see these two paintings celebrate one of the important features of Brixton - its market. Here's hoping they serve as a reminder of the market's role in the community for another 20 years! This mural is in fair condition. The only damage is from materials dropping down the front of the mural. A coat of varnish and a clean would make it last for another 20 years.